PLAN made according to available finances and to the priorities in the farm. Expected end: April / May. After this stage i can have a shelter, and volunteers/ karma yogis may come for camps, help when weather is fine. Expected start as soon as money comes in. This stage will allow the farm to live again, watering will be possible thanks to the pump in the drilling, and organising seminars might also become possible again. 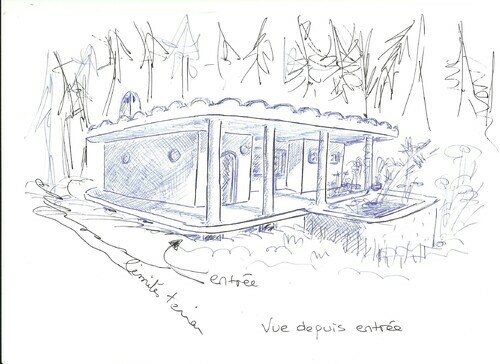 A camp with KYK team might be organised in Autumn to learn technics for ecological building that we could apply to my house. Planned start: next year, after completion of all previous stages, after complete study and preparation of the project, and according to finances. How: with KYK team supervising the preparation and work on the field, organising workshops. 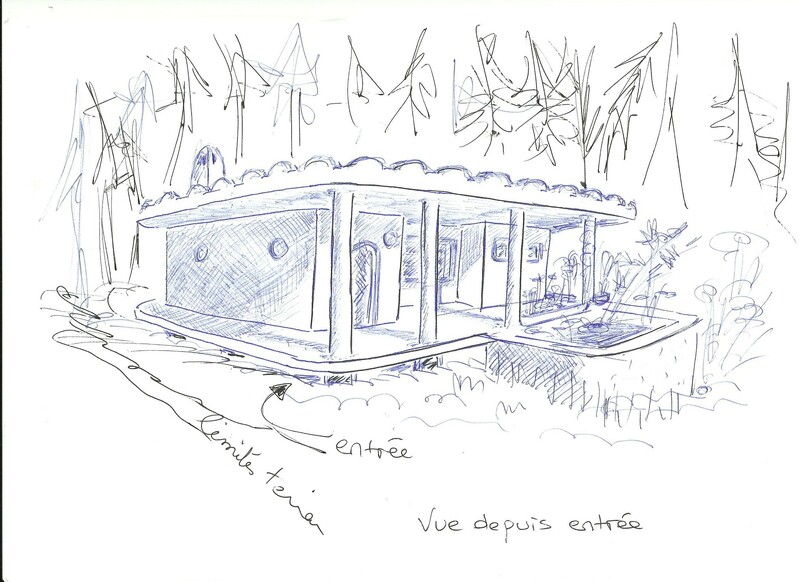 KYK team are french architect, permaculture designers, ecological oriented people and friends. We shall probably know more about lotus pond and anahat house in Autumn. So that i might have a shelter as soon as possible, a « usta » (master in work) has been contacted and should take the hard work construction of my house. Only hard work, first for financial reasons, second because i also wish to add more personal decoration and for this friends will be invited, specially KYK team who is supporting and helping from the beginning. 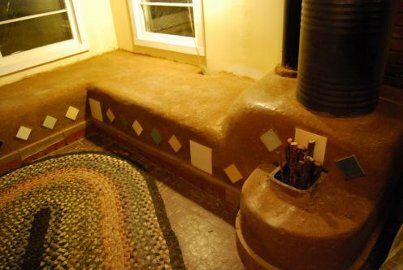  earth brick walls with earth and straw if possible, if not, ciment sand and lime.  doors and windows have been bought second hand, wonderful pieces of worked wood. The usta will build the wall accordingly.  a small pond in front of the house will collect rain water and allow some water plant to live and bring some freshness.  dry toilet will be inside the house. See drawing.  bath room with a bathtub, and water goes into the garden, only ecological soaps are used. The work should start beginning of April and should last around 10 days. The expanses are covered by the donations already received. Already started, it takes place using the carpentry and roof of Chandi. The tent will be removed, palets will be place on the floor, and walls will be covered with wood. A channel will be digged to avoid flooding. There is already a sink, and gaz cooker. The expanses are covered and work has started. Only ONE solar panel is needed, ONE accumulator, ONE charge controller. The 600W inverter is already in the farm and should be enough here. In the further steps, more elements will be added. Second step : allowing the drilling water pump to work so as to supply water to the trees. Around 10 m2 solar panels, a SECOND accumulator, a 2000W inverter, and all accessories like cable, posts etc.. Yet almost all pipe network has burnt and will have to be replaced. It flew partially away during a winter storm. Some burning particules having reached the roof, there will be some places to repair. And mostly the front of Saraswati will have to be arranged for it becomes flooded during storms. Most of all: creativity and some hand work to fix it all ! We hope to be able to host in Autumn the KYK team who could teach us techniques of ecobuilding which we could as well apply to my house, realising nice coverings and decorations. Half of the geomembrane EPDM has burned, and the other half might be fixed, presenting only small holes caused by burning pieces. So the present idea is to make the pond smaller, arranging the earth all around it, including around ANAHAT house (which would be near the pond) and using the available geomembrane to cover the pond. Slopes would be smoother, dimensions would be more appropriate. We were at this stage before the fire. So we shall soon come back to this stage, after completion of the previous steps. AnAhat house will provide shelter for seminars during hard weather, as well as offer home for residents, participants to seminars. It should be suitable for all weather, including extreme hot and extreme damp weather that we have here. The study has to be restarted from the beginning according to the new situation. The KYK team is supporting and guiding for this work, and hopefully will be able to come to guide a solidarity ecobuilding camp. Present idea is that ANAHAT house could be build around the ancient burned house. The ancient burned house would be transformed into a green house.